I recently had the opportunity to drive a handful of classic cars. 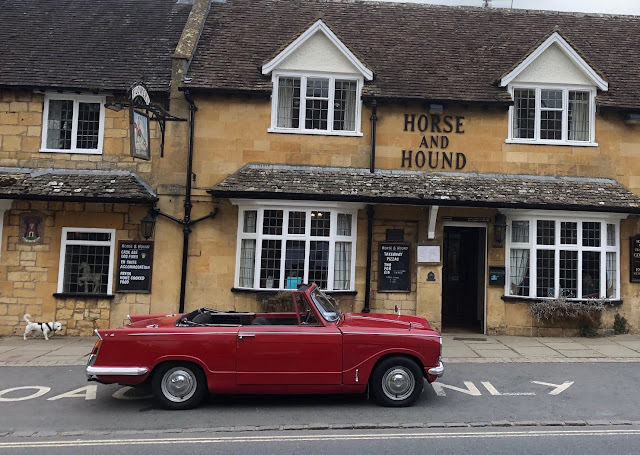 It was organised by Great Escape Cars as a day for journalists and bloggers and replicated their Cotswolds Highlights Tour. I arrived at 9.30am at Great Escape's unit in Redditch - right at the south end of the Midlands and almost touching the Cotswolds. They're located down a road full of industrial units. You drive past the usual light industrial stuff...and then you see it. Where most units' car parks are full of Transits and pickups and Corsa vans Great Escapes' is full of cars from the 80s, 70s and even 60s. This is automotive heaven. After we had introduced ourselves to each other and grabbed a drink Graham explained their recent change in philosophy. The business used to hire a classic car out for a day or so but now they've realised that what most customers want is a taster of each car. An hour or so in the car of their dreams. This might sound odd but, trust me, it isn't. When we drove the E-Type it was awesome for the first couple of hours. And then it rained so we had to put the hood up. And that wasn't entirely draft-proof, which old cars aren't. And it was cold, and steamed up a bit. And after a while the whole experience started to become slightly less awesome because classic cars are also old cars and old cars don't have the dynamics of modern cars. Anyway, back to the present. Graham promised us we'd enjoy this format. We would drive five cars over the course of a day. If you're a paying customer you get to choose which cars but our cars were chosen for us. A few people took the trouble to check out the current fleet (it does change) and put requests in. You share a car with someone. You can swap around as much as you want but stay with your partner over the course of the day. Happily an old friend had suggested we partner up. Our first car was a Jaguar XJS V6 in red. Knowing we'd be in another XJS later in the day my friend did all the driving for the for first leg. It was an 80s Jag and as such was clad in leather and wood (none of your modern veneer either but actual chunks of wood) and was smooth and refined as you'd expect. What I had totally forgotten about old cars is quite how small the interiors are. The cabin was snug and everything much closer than you'd get in a modern car. There was also no storage space. Like, none. I had a bottle of water which I had to put in the footwell and everything else went on the back seat. Each stage is around 45 minutes and 20 miles and I thoroughly enjoyed navigating using the Great Escapes amazingly comprehensive instructions. 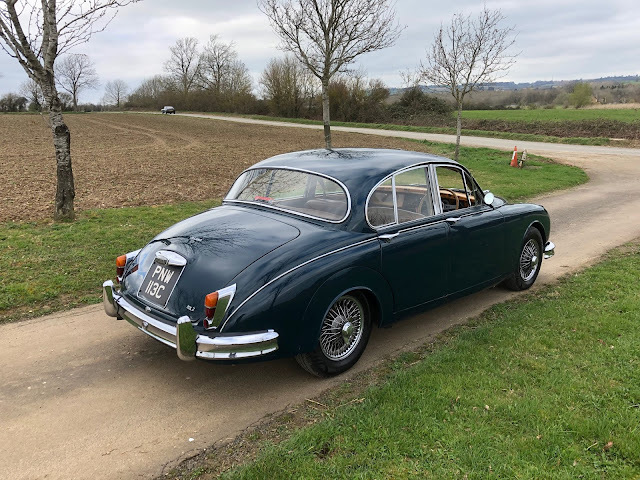 After a tea break (literally, at Broadway Tower) it was my turn to drive and the next car was one of the jewels in the Great Escapes' crown. The car was the mighty HMC. This is essentially an Austin Healey 3000 MkIII. You would imagine it's from the 1960s or 70s but in reality this car was built in 1999. You'd never know it though as it's a faithful replica of the original car. 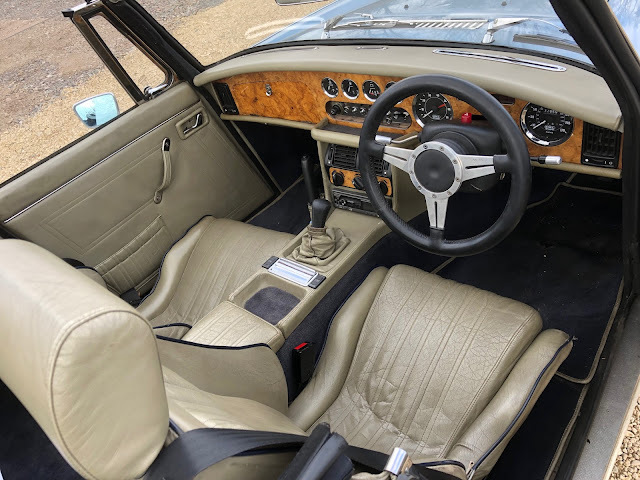 You climb in to the cramped cockpit, all tan leather and wood and the steering wheel is in your lap. You move the chair back little but the wheel is still in your lap. The A-pillar is also far closer to your face than you're comfortably used to in modern cars. Everything is at hand. Behold! There is a small recess in which you can dump your mobile but that's it. Insert the key and fire up the engine and...WOAH! 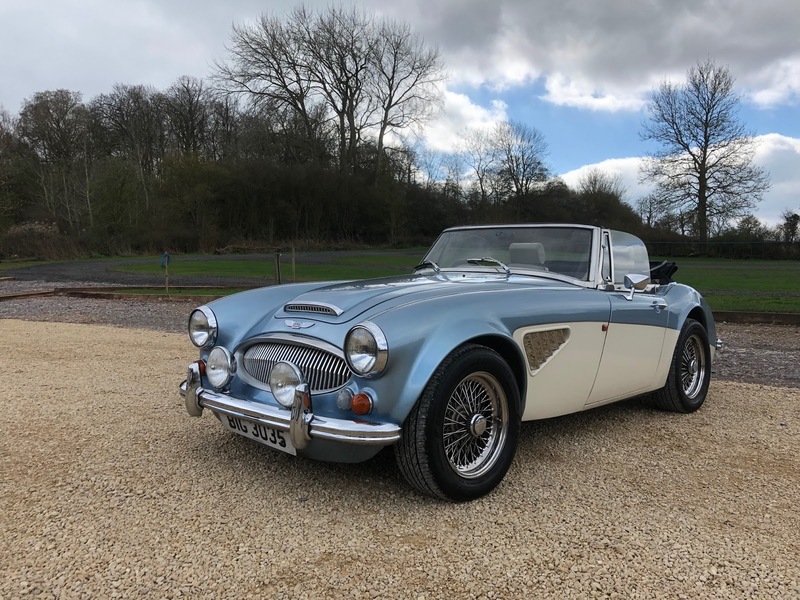 This HMC isn't fitted with the original Healey 2.6 or 3.0 inline-6. Instead it has a modern(ish) Rover 3.9 V8. Blip the throttle. More fabulous. Engage 1st and ease the clutch and feel the grunt. I used to own a Discovery 2 with this exact same engine and it was far quieter and more refined in the Landie. In the HMC you feel it, you hear it and you engage with it. The gearbox is remarkably good. The throw of the gearbox is short. It's nothing like as smooth as, say a modern Fiesta or Golf, but it is comfortably mechanical. The HMC is great fun to drive. There is no room for your right arm so it sits atop the door. The sound and grunt of the engine carries you along on a wave of enthusiasm. You laugh with your passenger at the experience of barreling along in the thing. People look at you, you acknowledge them with the briefest nod of the head. You enjoy. After a decent drive in the HMC we stopped for lunch at the relatively new Caffeine and Machine cafe and gawped at the machinery coming and going in the car park. They've really found a niche and have located their premises perfectly. Engineers from JLR and Aston Martin turned up in amazing machinery and someone turned up in Ferrari Daytona to go get a coffee and watch people gawp at his car. After lunch we were given the keys to a Mk2 Jaguar. Now this would be a far different experience to the HMC. The Mk2 was manufactured in 1965 and was powered by a 3.8 litre inline-6 engine. The Mk2 was designed in the 1950s and it feels it. You climb in and it feels like you're sitting in a museum. It's relatively spacious but there's still no cubby space to put a phone or drink. Leather and wood abound. Great planks of wood, hewn from logs and planed, sanded and varnished by craftsmen. The colours are beiges and tans, natural in look, feel and smell. The driving position is OK. The chair is comfortable but a bit too upright. Adjustment is minimal. The steering wheel is large, wooden and thin. The engine fires up from a Bakelite button in the middle of the dash and is incredibly smooth. The getaway is anything but smooth. It takes quite some time to get used to but you kangaroo away from the off the first few times you try. On my first ever drive - from a fuel station on a main road - I hadn't shut the door properly so as we lurched down the road the door flew open and I cursed and almost fell out of the car as I grabbed the door to pull it closed. My passenger and I laughed so much it hurt our ribs. Having driven one before I know the Mk2 has pretty vague steering but this one was quite good. You don't want to drive too fast in it but it surprised. I enjoyed our spin in the old girl. Next up was my turn in an XJS. In 1985 I was 14 and that year a film called The Supergrass was released. 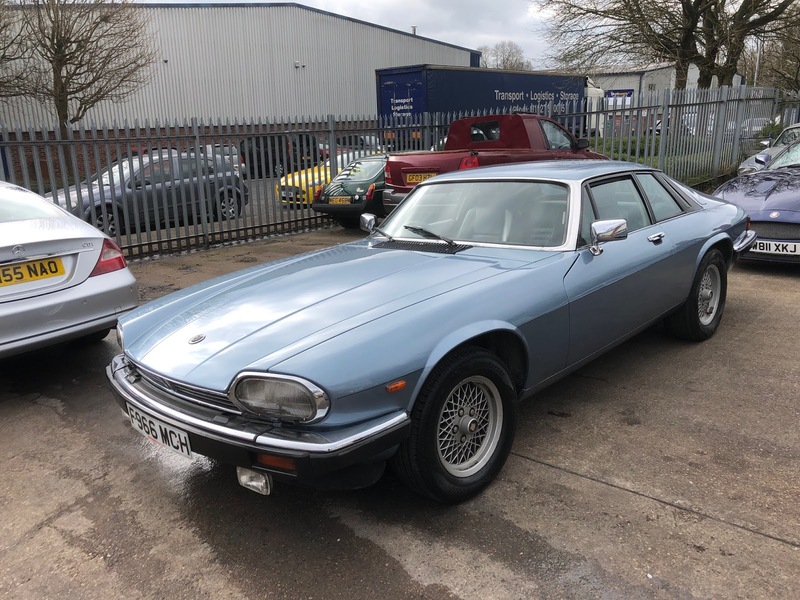 It was a Comic Strip film with the usual Comic Strip cast and featured Adrian Edmonson and Jennifer Saunders driving down to Cornwall in an XJS. Ever since then I've loved the XJS. It was cool then and it is cool now. Only now it is an old car. 'Our' XJS was a blue 5.3 V12 built in 1988. Back then it was rivalled only by the 911 as the ultimate sports coupe. They say that you shouldn't meet your heros. In this case I was glad I did. The XJS' cabin is cramped. Once in the comfortable seat you could touch the windscreen with the palm of your hand (please don't, I have a thing about fingerprints on windows). The pedals and wheel are perfectly placed. Fire up the engine and... Is it on? Yes you can feel it. Blip the throttle and you can feel it twist. This is an engine with modesty. It has power and it has torque but it does not feel the need to shout about them. They can be accessed when necessary but it prefers smoothness and effortlessness. Slip it into drive and and the steering feels oily smooth. The Jaguar virgin might think this is simply too much lightness but it is a feature that dictates the feel of a true Jag right up to the present day. Slip and slide along at speed and the V12 XJS simply glides with your steering inputs minimal. The bonnet is as massive as the windscreen is close. All in all this was one hero I was glad to meet. I thoroughly enjoyed my time with the XJS. Our final drive of the day was a Triumph Herald. This was a stand in for the Morris Minor Traveller who's dynamo gave upon the ghost. People who knew about these things did not give us good feedback on the lowly Herald. With some trepidation we clambered aboard. It was tiny and open. The day was overcast but dry. If it had started raining I'm sure we could have pulled up the hood but I'm not sure how. We pulled away and were surprised. Sure the tiny Herald is a tiny car with virtually no room for anything in the cabin, but the engine was sprightly. It's the 1400cc from the Spitfire and sounded great, especially as you cruise along on a trailing throttle. The steering was pretty vague and the gears were...not always easy to engage. Third was a particular challenge. But my co-driver and I found the whole experience charming. 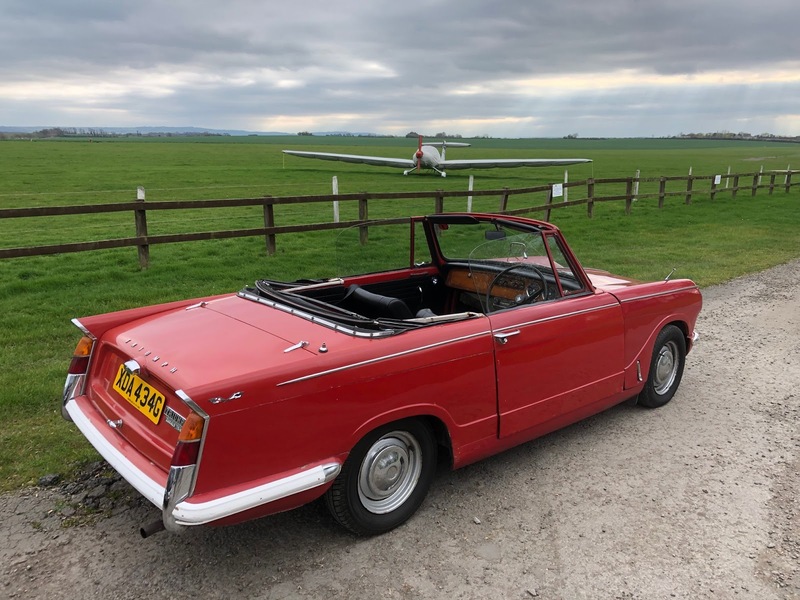 We found that the top speed of the Herald was around 50mph, after which the engine and gearbox felt stressed enough, and the brakes' capacity to come to a safe stop was about as much as was safe. But stay under 50 and it was a hoot. We'd set off from Redditch at 10am and at 3.30pm eased back in to the road leading to the unit occupied by Great Escapes. The day had been fabulous fun. The cars were brilliant to drive and I'd met my hero, the XJS, and had not been disappointed. Graham had been right to restructure the business towards shorter drives in lots of cars. More than an hour or so in most would be a little too much. Although I could quite happily steer the XJS all day.